Some of the recent data that has come in from Samhain authors has done something interesting to the chart for sales of books that have been available for at least a year. I would love to know if this is a good average or being affected by some extreme outliers. 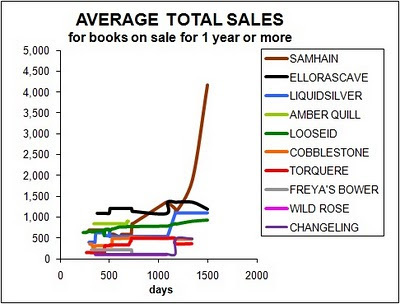 So I would encourage any and all Samhain authors to send in their data so I have a good representative arithmetic mean.